The sound you hear in the background is my dehydrator. I apologize, I know it’s loud. That’s why it’s in the dining room. Sorry about that but it’s the time of year where I seem to use it the most. I harken back to this time last September when my oldest OS was preparing for his second ACL surgery and I was busy making him healthy treats to help his recovery. Wistful, relieved and bountiful describe that time and season of life. My house smells like apples and cinnamon. I have apple slices, apple leathers loaded in many dehydrator trays and granola filling in the remaining of the nine trays. Ike is eating his weight in granola and in the past week, I’ve also dehydrated beef jerky for a friend which I carefully kept away from my drooling, orange hair, freckle face OS. Autumnal colors enter my home and since finding the Sherwin Williams ColorSnap app, I’m a dither with discovering possible color pallets for my home, should the opportunity ever exist. So today I grabbed my iPhone after making a batch of granola and took pictures. With 50 pounds of old-fashioned oats, (yes, 50), I’d say I have a lot of granola to make. Throwing in some dehydrated cherries from the summer or a handful of pepitas and suddenly I feel like a fancy girl. I like fancy girl feelings. 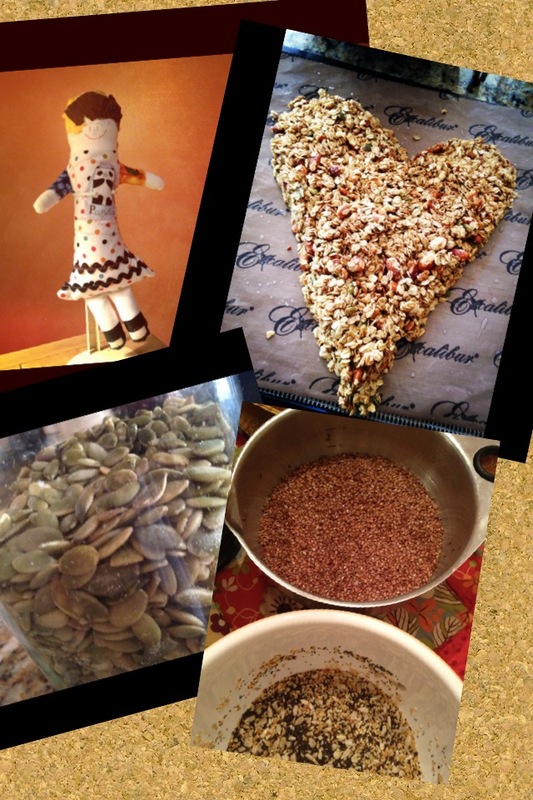 With a hankering for another kind of crunchy, I began soaking flax seed, sesame, poppy and pumpkin seeds for a raw cracker and took more pictures. The colors were captivating and the names Sherwin Williams uses for each color, well to me they seem inspired. (Btw, I’m not a paid endorser of Sherwin Williams!). Which one of these colors would you most welcome into your home? I’d love to hear and if you use the app, tell me what colors you discovered. In my next post, I’ll write about pre-soaking grains. I’m learning about this concept and it’s intriguing. The night before, put the flax seeds in a medium bowl and add 1 cup of water. In another bowl, put the mixed seeds and add water to cover. In the morning, drain the mixed seeds well and add them to the soaked and now gel-like flax seeds (these need no draining). Add the salt and paprika and stir well with a fork to combine. Spread very thinly on one or two dehydrator trays lined with solid sheets. An offset spatula, the kind you use to frost a cake – makes spreading easier. Sprinkle a touch more salt on the surface. (I don’t because they seem too salty). Dehydrate at 110 degrees fahrenheit for about six hours until dry and crisp. About three hours into the dehydrating, flip the crackers so they will dehydrate evenly. Break into pieces once cooled. One more thing, Excalibur is having 10% off until 9/30/2012, check it out! Shawn, tell the Hubs if he loves you, he’ll get you one of these too! I’m gonna try your crackers. I looooove my dehydrator!!! Thanks for the recipe, Cindy! I’m excited to try it once I can convince Dean that I not only need a Vitamix, but a dehydrator! Looks like I found a very expensive hobby, but oh so fun!! And, for the record, I’d go with Mexican Sand. I’m a neutral kind of girl! Yes, Shawn, these are great items! Just use this line, “Dean, if you really loved me, you would get these for me.” That should work. And if not, save up, be patient and wait. I did get a bunch of women together to make a bulk purchase of dehydrators and we got a group discount. We got a good deal and free shipping. I think I ordered about 12 of them. That might be something to consider when the time is right. I know you are very passionate about living a healthy lifestyle and it won’t be a hobby, these things are congruent with your food philosophy. I don’t consider this a hobby but I find it all very fulfilling. I made a green smoothie for us today and added carrot and spinach powder to the mix. I felt like a fancy girl.